A high net worth divorce can be very time consuming and difficult to understand for couples. 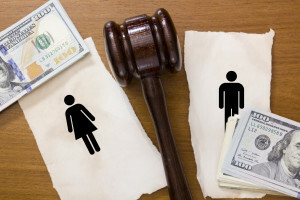 Getting a divorce is already a daunting process, but when there is high net worth involved, the division of a couple’s assets can make the process even more complex. According to Virginia laws, property acquired during marriage is considered “marital property”. Marital property, is subject to equitable distribution between both parties during the divorce proceedings. There is also what’s called, “separate property”, which is any asset that was owned by the husband or wife before they were married, in addition to an inheritance, or gift that was given to only one spouse, or any asset obtained after the couple separated. This is further complicated when that separate property is combined with, or “comingled” with marital property. Because couples have merged their lives and assets together for some time, there becomes a grey area which prompts the question, what is rightfully or lawfully mine in a divorce? During divorce proceedings, all property and assets will be valuated and classified. Afterward, they will become subject to equitable distribution. However, this does not guarantee that any or all assets will be evenly split “50/50”. It is very important to know that there are many circumstances that affect the distribution of assets in a divorce. It may come as a surprise to some couples that even pensions and retirement funds may be classified as marital property, and therefore may be subject to distribution between spouses. If you are on the verge of a high net worth divorce in Northern Virginia, it is critical to have a knowledgeable and experienced lawyer by your side the entire time. The truth of the matter is, there is a lot at stake, and for your family’s sake, you want to make sure that all of your assets have been divided lawfully, and fairly. The Manassas divorce lawyers at The Irving Law Firm, P.C. have been practicing family law in Manassas, and Northern Virginia for over 15 years, and have represented many high asset/high net worth clients before. If you’re in need of a knowledgeable, dedicated, and experienced divorce lawyer, contact us today, and schedule a consultation to review your case.